Haute Hippie is an advanced contemporary brand that creates products inspired by travel and unique details. Haute Hippie came to Wondersauce to refresh its marketing and brand message in order to reach a new, younger audience. During the initial discovery phase, we learned that Haute Hippie's marketing didn't match quality and uniqueness of their products. While their products were almost luxury, their brand was not. Instead of telling seasonal stories that followed traditional fashion guidelines, I worked with the art director to create a monthly theme to tell the story of the clothing across each digital touch-point. To bring this to web, I worked closely with the senior UX strategist to outline the content strategy and how the homepage would change each month. We featured trend stories alongside new arrivals and collection stories on the homepage. While the website was our main hub for editorial and product content. We used social to tell a deeper story and provide more detail each piece. We balanced content that included editorial, product, lifestyle brand moments like quotes, and behind-the-scenes content. Wagner Brake is an aftermarket auto parts brand that sells brake pads and other braking products. They have an established Technician audience, but consumers don’t know who they are. At Wondersauce, we pitched and created a campaign and contest to spread brand awareness amongst a consumer audience based off one of their popular social content themes called #ThingsWorthBrakingFor. The message: Wagner Brake provides safety and security in your car, so you can enjoy every moment. I worked alongside the product manager and design director, we created a contest that allowed fans to enter daily with images of things they founds worth braking for. The grand prize was a weekend getaway to one of nine American cities. 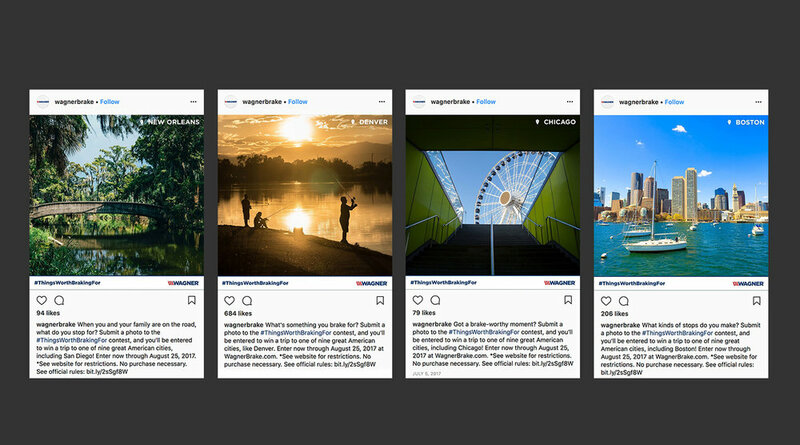 To promote the contest on social, we utilized advertising on Facebook, Instagram, and Pinterest, prioritizing Instagram to target the travel and foodie lifestyle audience. In this phase, I created the media plan, promotional plan, and ran and monitored the ads. #ThingsWorthBrakingFor earned the most entries out of each contest, earning over 6,000 entries. Across social promotion, we reached 2.4 million people and earned over 15,000 clicks from social. This campaign taught me a lot about holistic media planning and how to promote a not-so-consumer facing brand to consumers. Western Rivers Conservancy is a conservation group based in the West. Having conserved countless rivers with smart fundraising and grants, WRC turned to Instrument to create a crowdfunding campaign to raise funds from individuals in order to conserve Blue Creek off the Klamath River. Because WRC's social reach was small, we chose to partner with photographers on Instagram to spread awareness and to capture Blue Creek. I worked with producers to find the right photographers, pitched to each one, and created photographer playbooks. For WRC's social, I created an editorial calendar, created pitch decks for brand partners, and created the campaign playbook. After the campaign launched, I created weekly reports with key insights and recommendations. On Indiegogo, I collaborated with the writer and client to create the campaign copy. I created the perk structure (which was strictly digital and experience-based perks), and monitored page activity. Although, WRC did not reach their goal, Save Blue Creek was a project I honed my skills in content strategy, social media experience, analytics, writing, and influencer and media pitching.